Unlike most mini golf flags, the PutterUp model at PushNPutt is a truly innovative design. We offer a patented line of interactive golf flagsticks that are perfect for golfers of all ages and abilities. Whether you own a mini golf course or a simple indoor putting green, our products are perfect for you! For decades, golf flags have been used for little more than to designate the end of a course. But not anymore! Jerry Mallonee, inventor of the PushNPutt golf flagstick, has revolutionized the putting profession. Relieve stress to your back and knees with his patented invention, the PutterUp flagstick. No other mini golf flags offer the same interactive mechanism that gently lifts the golf balls from the cup and evenly disperses them onto the green. 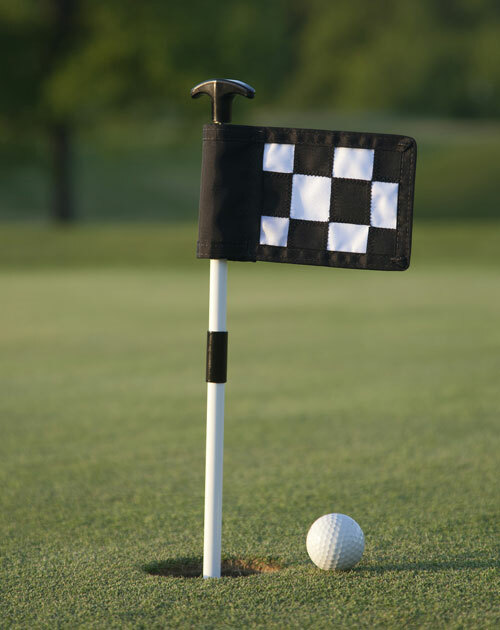 In addition to lessening stress on joints, our mini golf flags also protect your turf! To avoid bending over, some golfers will use their putter to dig out their golf balls from the cup. This can inflict damage both to the cup and the surrounding turf. Decrease your maintenance costs by installing our mini golf flags. They protect your turf and minimize damage by removing the need to dig out golf balls. Instead, golfers can simply hook their putter on the top of our PutterUp model, gently lift up, and their golf balls are raised to the putting surface. And our patented design ensures that the balls never fall back into the cup! Our flagsticks can be easily removed if necessary. Our flags are made from high-quality stainless steel, outdoor plastics and nylon that can withstand any weather condition. All of our products are also made in our North Carolina factory, and are completely American-made. We’re so confident in their quality that we back them with a one-year warranty! In addition to our PutterUp model, PushNPutt also stocks the LiftNPutt and PushNPutt models. These full-sized regulation flagsticks offer the same convenience of the mini golf flags. For the LiftNPutt, simply lift up gently on the flagstick, and the cup mechanism raises the golf balls to the putting green. For the original PushNPutt, simply push down gently on the flag pole and the same result is achieved. When you’re ready to own one of the most innovative golf products in the last fifty years, shop the selection at PushNPutt. All of our products feature superior quality materials and can be customized with different colors and custom embroidered flags. Whether you own your own country club or just want a more convenient way to practice putting in your home office, our mini golf flags are a great addition to any course.